Stocks in the agricultural sector are actually a key way to make money from the Internet of Things revolution. 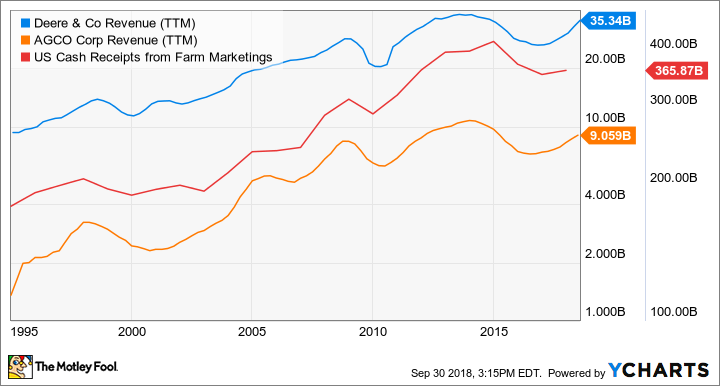 In order to understand how IoT has changed the investment case for Deere, it's a good idea to look at the traditional cycle of demand for its agricultural equipment. As you can see below, Deere revenue (I've added its peer AGCO by way of comparison) tends to correlate with movements in U.S. farm cash receipts. This makes perfect sense, as growing income will encourage farmers to buy new equipment while stagnating income will induce farmers to avoid making capital investments. DE Revenue (TTM) data by YCharts. In turn, U.S. farm cash income is determined by a combination of income from livestock and highly variable income from key crops such as corn, wheat, cotton, and soybeans. US Cash Receipts from Farm Marketings data by YCharts. All told, buying stocks in the sector usually implied taking a view of where crop prices were headed -- something fiendishly difficult to predict given the uncertainty of weather patterns. To be fair, you are never really going to fully avoid the vagaries of crop price movements and farm income when you buy agricultural stocks, but the IoT revolution has added a new growth driver to their earnings prospects. In a nutshell, Deere is adding IoT sensors, onboard computers, telematics solutions, and precision hardware solutions to enable farmers to better manage their operations. Meanwhile, Raven Industries' core applied technology segment offers field computers and application controls that help farmers guide and steer equipment. Raven's recent results show high-single-digit growth in that business. Image source: Deere & Company. IoT can help predict when combine harvesters need servicing or maintenance, which helps to reduce downtime. Furthermore, precision agriculture means farmers can very accurately prepare land and monitor and control seeding, feeding, and harvesting, with the benefits being a reduction in input cost and an improvement in crop yield. Adoption rates of the new technologies are very high and it's helping Deere improve overall sales growth by offering tangible benefits to farmers. Deere has a margin expansion opportunity through selling more of its advanced technology solutions. Discussing adoption rates of the new technologies, Chief Information Officer John May noted: "If you look over the last three years and you look at each individual region, all four regions across the globe, every year we see an increase in the overall take rate and adoption of the technology." He also told investors that "recent precision hardware introductions demonstrated significant economic value to farming operations, and in some cases, already achieving take rates in excess of 50%." In other words, half of the customers eligible to take up certain precision hardware solutions are electing to order them. So we know sales are receiving a benefit from new technologies, but what about margin? Bank of America analyst Ross Gilardi asked about the matter on the earnings call. May replied, "As we think about margins, we've not dialed in exactly what this means from a margin perspective or carved that out. But we do feel like it will contribute, is and will contribute to margin growth in the future." All told, there's evidence that Deere's sales and margin are receiving a boost from IoT-based technologies. This is a long-term positive for the stock and investors should upgrade their expectations accordingly. 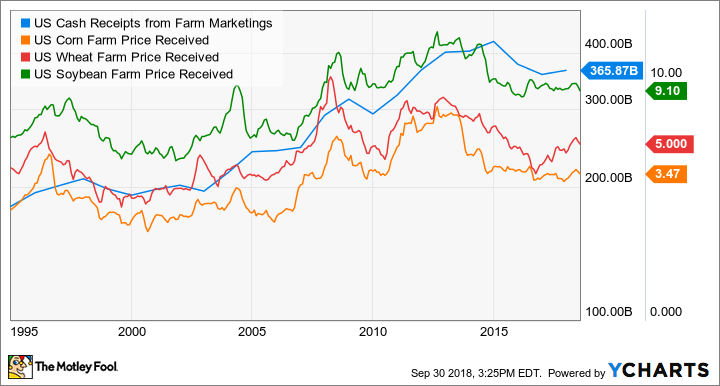 Furthermore, given that current demand is being driven by replacement and not a strong increase in crop prices or farm income, there's a possibility that, if/when market fundamentals turn for Deere, the company can generate relatively more earnings than in previous cycles.